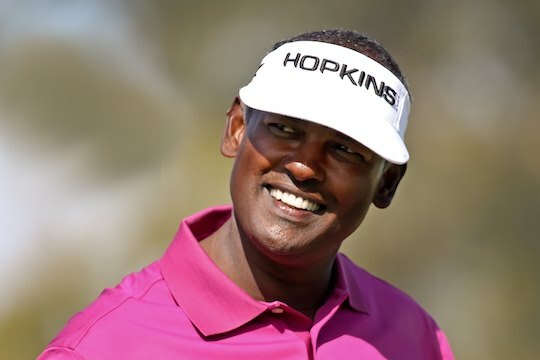 Former World Number 1 Vijay Singh will return to his home nation of Fiji to compete in the Fiji International golf tournament, organisers confirmed today. To be played at the spectacular Natadola Bay Championship Golf Course from August 14-17, Fiji’s greatest ever golfer is the first marquee announcement for the new tournament to be jointly-sanctioned by the PGA Tour of Australasia and OneAsia. “The Fiji International is a big opportunity for Fiji and I wanted to be a part of it,” said Singh. To be played the week following the US PGA Championship, Singh said he had always hoped to be a part of the Fiji International and was glad that the schedule provided an opportunity for his involvement. “Since it was launched I knew it was something I wanted to be a part of,” said Singh who grew up living nearby a golf course and was introduced to the game by his father. “There are plenty of kids in Fiji who have never seen a golf club, never hit a golf ball. I know the PGA has plans for growing the game in Fiji and I want to play my part,” added Singh. In a career that spans more than 30 years, Singh has made headlines all over the world. At 51 years-old, Singh has won 58 international titles since turning Professional in 1982, including three Major titles. His first Major win came at the 1998 US PGA Championship, a tournament he also won in 2004. The ‘Big Fijian’ also claimed the 2000 US Masters at Augusta National. He was World Number 1 on the Official World Golf Ranking for 32 weeks throughout 2004 and 2005 and was officially inducted into the World Golf Hall of Fame in 2006. Singh was born in Lautoka, Fiji and grew up in Nadi, a 40 minute drive from where the Fiji International will be held at Natadola Bay. The Fijian Attorney-General and Minister for Tourism, Aiyaz Sayed-Khaiyum, said that it was a matter of great national pride to have a Fijian of Singh’s calibre competing in the tournament. “We look forward to hosting some of the world’s top golfers in Fiji, but of course it will be particularly special to welcome Vijay home,” he said. Brian Thorburn, Chief Executive Officer of the PGA of Australia, said Singh’s participation was important to the tournament’s success. “Vijay is synonymous with the game in Fiji but his success and adoration transcends golf,” said Thorburn. Launched in September last year, planning is well underway for the inaugural tournament which will boast a minimum prizepurse of US$1 million. The Fiji International is expected to produce a multi-million dollar boost for the Fijian economy, in addition to flow on benefits including the growth of the game in the region. Designed by Singh, the Natadola Bay Championship Golf Course is renowned for its sparkling backdrop of coral reefs and the Pacific Ocean that line 15 out of the 18 championship holes.